High school seniors and parents are invited to join us at this meeting! We love sharing tips and info that might be helpful for new Aggies! High school juniors and parents are also invited. You’ll be submitting your dorm requests before you know it, so take advantage of this opportunity to hear more about the process! Plus, ballots will be available for current active members to indicate the student organizations to which they would like to direct a portion of this year’s fundraising profits! Mark your calendars for these other fun upcoming events! For a complete listing of our meetings and events, see the full calendar here. by mailing a check with the 2018-2019 membership form (click here) or via our secure online payment link here. Just select Membership 2018-2019 and click “add to cart.” For more info, contact Isabel Campbell at dcammembership@gmail.com. Our General Meetings are held at University Park United Methodist Church, 4024 Caruth Blvd., Dallas, TX 75225. 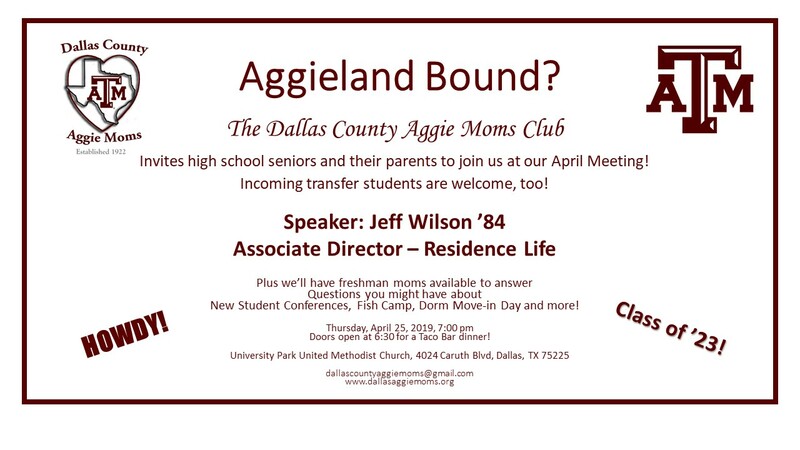 Dallas County Aggie Moms’ Club is a service organization that supports Texas A&M students and their parents. At our meetings and special events we learn more about the University from each other and from great guest speakers. We also raise funds to provide student scholarships and financial support to student organizations. Aggie Dads and friends are welcome at most of our events.